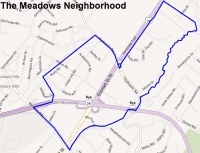 The Meadows neighborhood ("The Meadows") is a Charlottesville neighborhood as designated by the Department of Neighborhood Development Services, comprising residential and commercial developments on both sides of U.S. 29. The neighborhood is in the north of the city, with the northern borders contiguous with the city's boundary to Albemarle County, including along Greenbrier Drive. The southern boundary is the Meadow Creek. The southeastern corner is at tbe intersection of Emmet Street and the U.S. 29/250 interchange. The northern corner of the neighborhood is home to the Seminole Square Shopping Center. Meadows Presbyterian Church is used as a meeting place for the community. The Meadows is represented by the Meadows Neighborhood Association. The neighborhood will be impacted by the development of Stonefield in Albemarle County. ↑ Web. The Meadows neighborhood page, City of Charlottesville, retrieved December 8, 2011. This page was last edited on 2 June 2012, at 12:26.